At each significant step in the Cardinals career of pitcher Barney Schultz, Johnny Keane played a prominent role. 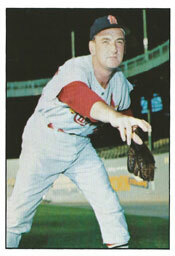 Keane was the minor-league manager who helped Schultz reach the majors for the first time with the 1955 Cardinals. Eight years later, when Schultz was placed on waivers by the 1963 Cubs, Keane, then manager of the Cardinals, convinced general manager Bing Devine to make the deal that returned Schultz to St. Louis. A year later, in August 1964, when the Cardinals appeared to have slipped out of contention, Keane made Schultz the closer. The knuckleball specialist rewarded his mentor with a stretch of outstanding relief that carried St. Louis to a National League pennant and a World Series championship. After his playing career, Schultz remained with the Cardinals as a minor-league instructor and then pitching coach on the big-league staff of manager Red Schoendienst. Schultz, 89, died on Sept. 6, 2015, in his native New Jersey. His story is one of how being prepared for opportunity and not giving up can lead to success. Schultz was 17 when he debuted as a professional player in the Phillies system in 1944. The right-hander played for five organizations _ Phillies, Tigers, Braves, Cubs and Pirates _ without getting to the big leagues. After the 1953 season, Schultz was acquired by the Cardinals from the Pirates’ Denver farm club. The Denver executive who made the deal was Bob Howsam. The Cardinals assigned Schultz to their Class AAA club Columbus club for 1954. The Columbus manager was Keane. Schultz posted an 8-8 record and 3.86 ERA in 41 games for Columbus. “Barney had a good fastball then, too, and I’d urge him to use it often with his knuckler,” Keane told The Sporting News. Convinced Schultz had found his role as a reliever, Keane recommended the Cardinals give Schultz a good look at spring training in 1955. The Cardinals agreed and Schultz delivered. At 28, he made the Opening Day roster of the 1955 Cardinals, joining another rookie knuckleball pitcher, Bobby Tiefenauer, in the bullpen. In 19 games with the Cardinals, Schultz was 1-2 with four saves and a 7.89 ERA. On June 16, Schultz was demoted to Class AA Houston. Schultz spent the next two seasons, 1956 and 1957, playing for Keane with the Cardinals’ Class AAA club at Omaha. He was 9-12 with a 4.19 ERA in 1956 and 8-7 with a 2.83 ERA in 1957. Schultz, 31, began his third consecutive season under Keane with Omaha in 1958. On May 26, the Cardinals traded him to the Tigers for Ben Mateosky, a minor-league outfielder. Freed from the Cardinals’ organization, Schultz worked his way back to the big leagues. He pitched for the 1959 Tigers and for the Cubs from 1961-63. In June 1963, the Cubs placed Schultz, 36, on waivers. Keane, in his third season as Cardinals manager, urged Devine to acquire the pitcher. The Cardinals submitted a bid to claim Schultz on waivers, and sweetened the deal by offering utility player Leo Burke in exchange. On June 24, 1963, the transaction was made, reuniting Schultz with Keane and the Cardinals. The only players remaining on the 1963 Cardinals who were with St. Louis when Schultz debuted in 1955 were Stan Musial, Ken Boyer and Schoendienst. Schultz was 2-0 with a save and a 3.57 ERA in 24 games for the 1963 Cardinals. In 1964, the Cardinals sent Schultz to Class AAA Jacksonville before leaving spring training. Schultz posted an 8-5 record and 1.05 ERA in 42 games before the Cardinals recalled him from Jacksonville on July 31 _ two weeks before his 38th birthday. Reunited again with Keane, Schultz yielded no runs in his first nine appearances for the 1964 Cardinals, earning five saves in that stretch. With Schultz protecting leads and closing out games, the Cardinals rallied to win the pennant on the final day of the regular season. Schultz had six saves in his final eight appearances, all scoreless. Overall, Schultz was 1-3 with 14 saves and a 1.64 ERA in 30 games over the last two months of the 1964 season for St. Louis. After the Cardinals defeated the Yankees in a seven-game World Series, Keane resigned and became Yankees manager. Pitching for rookie manager Schoendienst, Schultz was 2-2 with two saves and a 3.83 ERA in 34 games for the 1965 Cardinals before he was demoted to Jacksonville. In 1966, Schultz was a player-coach for the Cardinals’ minor-league Tulsa team. He was a Cardinals minor-league instructor from 1967-70 and served as Cardinals pitching coach under Schoendienst from 1971-75. Among those who praised him as a mentor were Cardinals pitchers Bob Forsch and John Denny. In 1977, Schultz was pitching coach for the Cubs. His prize pupil was Bruce Sutter, who developed into a closer under Schultz and capped a Hall of Fame career by helping the Cardinals win the 1982 World Series title.